There was still quite a bit of climbing to reach the top of the divide, which was also the start of Douglas County. What a stark contrast. On the Jackson County side it was mostly residences with no visible signs of logging. As soon as I hit Douglas County I was in a big clearcut, and immediately saw a loaded log truck pulling out of a side road. The next day I would ride though a few lumber towns and was glad to see the mills still operating, but today I just witnessed the cost of that prosperity. At least I was going downhill now, at a fast clip. The Trucker isn't quite as rock steady with a full load but I discovered it had more to do with the rear load than the front. I need to work harder at getting the rear load better balanced left and right. I passed though a very small town called Drew before reaching Tiller and the South Umpqua River. There is a big ranger station before the bridge over the river, but that was about it. There were no longer any stores in Tiller. 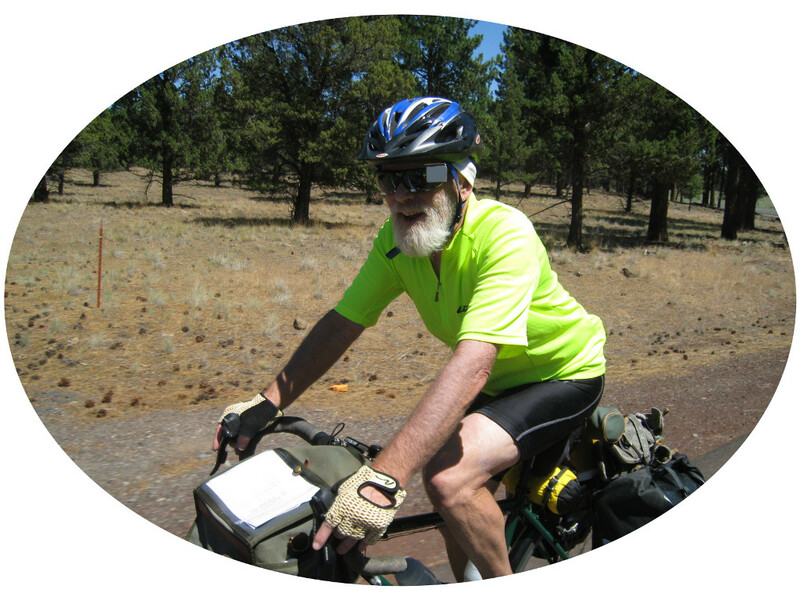 When I hit the South Umpqua I saw a USBR 51 sign. I later looked this up and could not find any reference of it on the USBR maps. Interesting. The road goes both ways along the river and evidently it's a good ride to continue upstream a ways. My route today took me downstream and into the impending rain. It was never more than a heavy mist, or light drizzle, but it was enough to require a rain jacket from time to time. 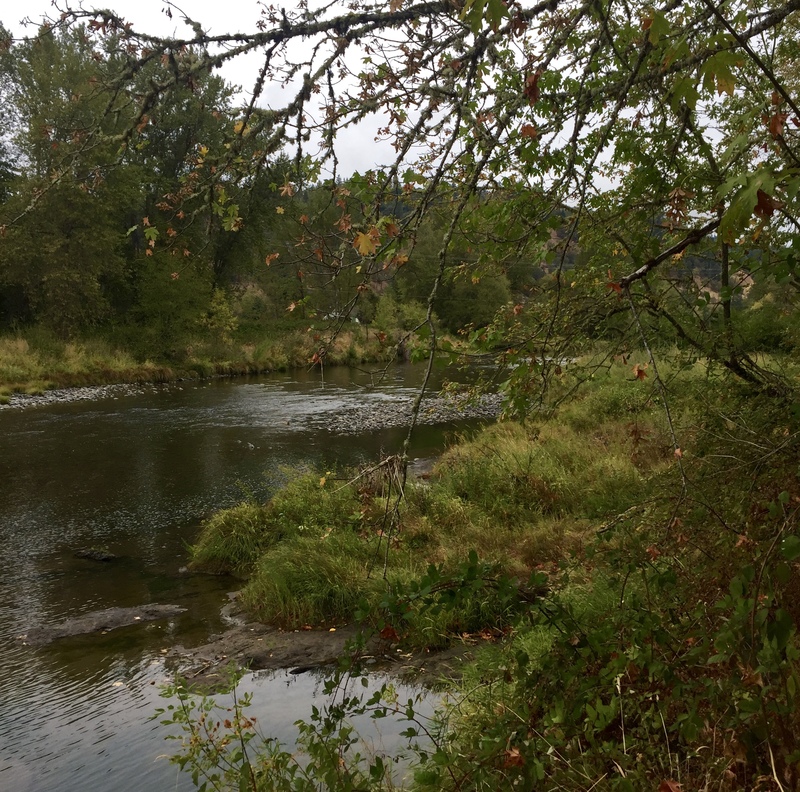 The South Umpqua is completely different, and not nearly as scenic as the North Umpqua. Rather than tick conifers this was mixed terrain with oaks, madrone, and a lot of scrubby stuff. It opened into a valley from time to time, but nothing that looked that rich agriculturally. Of course it was a gray, wet day. Everything looks better when the sun is shining. The road had a really good shoulder all the way to Days Creek, and then it completely disappeared in places, at the same time as the traffic increased. The rain was letting up by now and after a while the shoulder reappeared. I got to Canyonville and had lunch at a Subway. This was another town that I passed so many times on the freeway but had never been in the actual town. From the freeway all you see is the big casino, but the town is nothing like that. Of course there was a big hill to climb on my way out of town. Although it seemed out of the way, the route north required that I continue west to Riddle, and so I did. From there I did go north again to Myrtle Creek. I got off route at Myrtle Creek and started riding out the wrong road. I didn't know how far it would be to Roseburg. I pulled in behind a fire station to check Google Maps, and though about camping there, but decided instead to find a motel. So I headed back into Myrtle Creek and got a room at the Rose Motel, which was cheap but adequate. Most of the other guests looked like they lived there, and I had a nice chat with a motorcycle guy who said he lived back up the Trail/Tiller highway but stayed here during the week while he worked at a mill. Across the street was a nice Mexican restaurant where I had beer and enchiladas and was a happy camper. The South Umpqua River was not nearly as scenic as the North Umpqua.